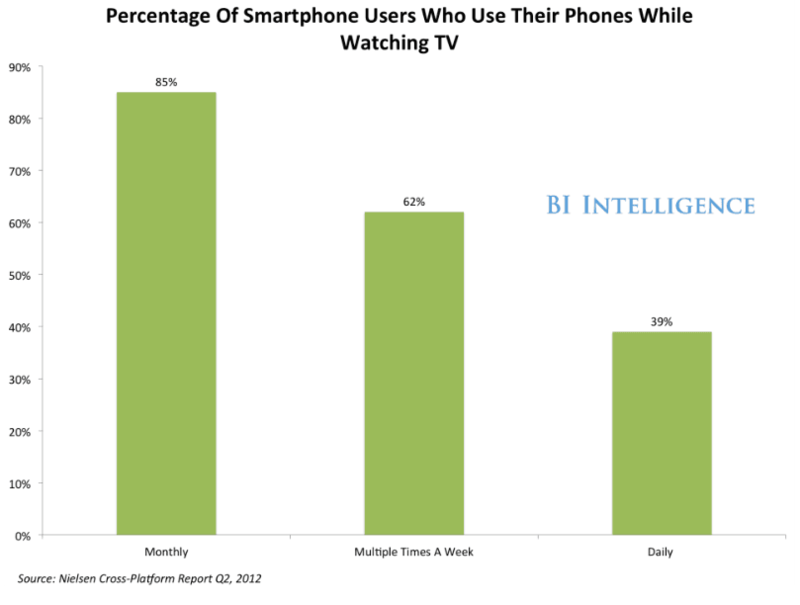 Your once far-fetched notion of adding mobile to your television viewing experience is slowly becoming a reality. Apple’s AirPlay feature, for example, lets users project whatever is on their iPhone or iPad screen onto a larger monitor by way of an Apple TV. But that’s not exactly what we mean here when we say “cross-platform experience”: instead, we are referring to a symbiotic relationship between your mobile device and the television program you are viewing. A recent study (the Nielson Cross-Platform Report) found that 85% of mobile users use their device(s) simultaneously while watching TV, and 39% do so on a daily basis. To many broadcasters and advertisers, this statistic suggests some significant unrealized potential. With such a high volume of device usage in conjunction with TV viewership, wouldn’t a bridge between the two imply a dramatically improved value proposition for mobile devices? Possibly, but not for certain. However, these statistics do not reveal the activities in which users are engaged on their devices while watching television. Are they browsing content relevant to the program at hand, or are they simply trying to make the commercial break seem faster by checking e-mail, tweeting, etc.? While the answer can be quantified, it truly depends on the level of interest the viewer has in the program. Looking up program related information on a tablet or smartphone while watching TV is only the 5th most documented activity. The 6th and 7th activities pertain to advertising: users who look up product info or coupons and deals seen from a TV ad. 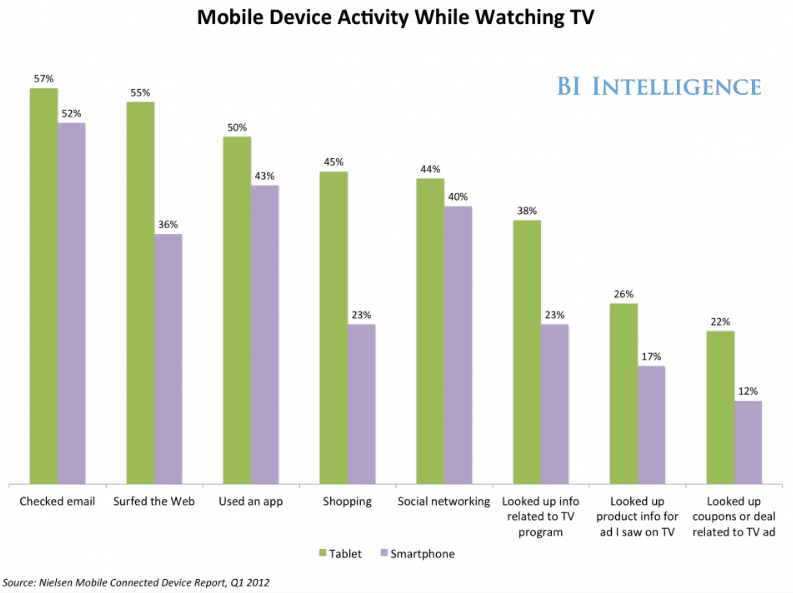 As one would expect, the most common activities among users who are watching TV is checking e-mail. So although the percentages of people engaging in TV-relevant activity is small in comparison to other activities, the pool of people is still astronomical since all device owners presumably have a TV. The concept of tying your mobile device to a TV program is not exactly new, either; during the Superbowl, for example, CBS offered live streaming on its website with access to camera angles not shown on the regular network. Showtime’s “Sync” for iPad is another existing second screen supplement that generates relevant content to the current show at hand. There is currently tremendous unrealized potential for advertisers and broadcasters. Since this is a relatively novel concept, it hasn’t been carried out by most networks. In fact, the percentage of people who will even engage with relevant content on their devices might be really small; nonetheless, even a minuscule percentage of television viewers could generate hundreds of millions in ad revenue. The only concern here is whether incorporation of the second screen with the original TV experience would be a fad destined to fail, or a sustainable solution for networks and advertisers. Another factor to consider are demographics. 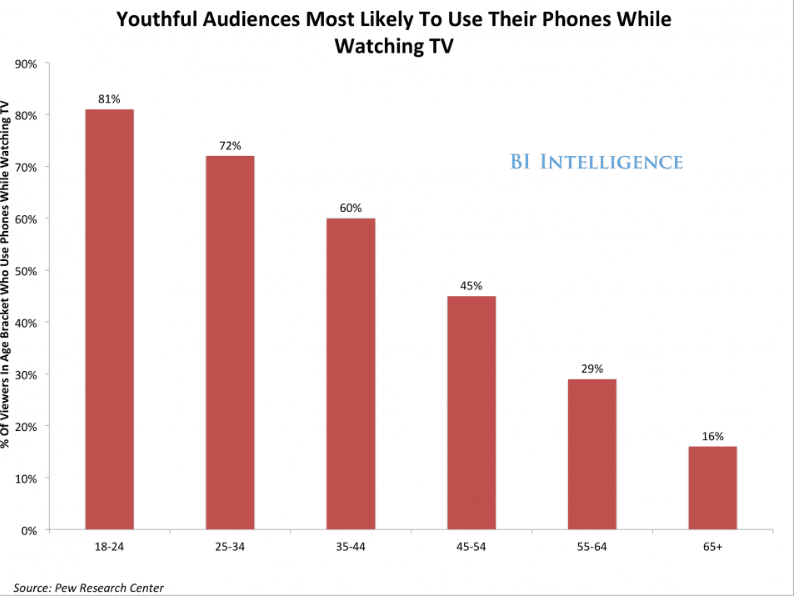 What age group is most likely to use their devices while watching television? According to the Pew Research Center, 81% of people between 18 and 24 years old are most likely to do so, while only 16% of individuals over 65 would probably use their devices simultaneously. What do you think of the cross-platform experience (Mobile and TV integration)? Is it a viable solution for creating value for users? Would you partake in it if you had the option? Let us know on Facebook, Twitter, and Linkedin, and don’t forget to like/ follow our pages while you’re at it! Onswipe makes it insanely easy for publishers of all sizes to make their content and advertising a beautiful experience on touch web browsers.